It’s been awhile since I’ve made a nice video outlining what I actually do at Lebanon High School. Many people do not realize that I only teach Music Tech. There is no band or choir or guitar class that I cover. We have one of the only programs in the country with the participation levels to warrant such an arrangement. My course track is unique too. There are few college paths purely related to Music Tech. In 2014, you still cannot get a Music Education degree with technology as your concentration. Most widely regarded programs are at the Masters or Doctoral level. Thus, the sequence of curriculum leads to a wider media production standpoint, allowing students to explore fields like broadcasting, theatre production, or apply the tech to a traditional music degree. Many students use the experience to bolster their applications to undergrad programs like these. Some will go into a related media field such as film production. Other students will just graduate and fly off to LA to become famous. Either way, I feel like we have tapped into a totally different kind of track than what I see happening at other schools – one that others, such as the CCM E-Media program and the NKU Electronic Media program are also serving. I’ll also be speaking about my program at the TI:ME Online Symposium this Monday at 3pm EDT, if you are interested in learning more about Music Tech & Media Production at Lebanon HS. It’s free for TI:ME members, and easy to register for through the website. 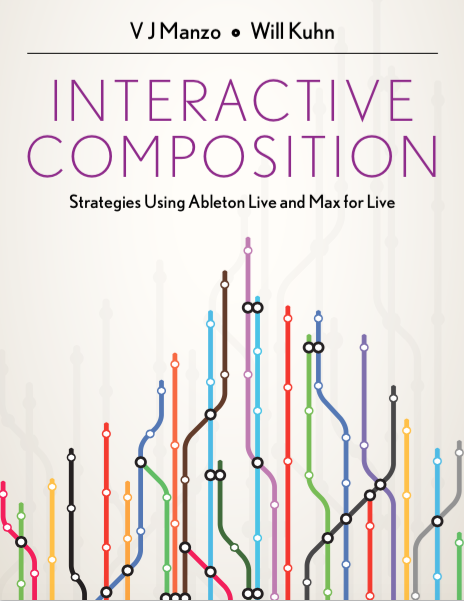 I have a book coming out in February, co-authored with the illustrious VJ Manzo, called Interactive Composition: Strategies Using Ableton and Max for Live. VJ and I have been working together for years to try to quantify and transcribe the way that music is being written today. Our work continues, and our shared passion could be described as defining the methods that modern musicians are using to write popular music. (For those asking: the subway map on the cover recalls both the visual nature of Max for Live patches as well as the vertical & modular nature of the interactive composition process, as well as reminding us of how cool subways are). The book won’t be released until February, but you can pre-order it on Amazon, Barnes & Noble, Books-A-Million and direct from Oxford University Press. Buy a set for your class today!